U.S. Stamp Collecting Kit with U.S. Stamp Album and U.S. Stamps. Kit contains Frontier U.S. Postage Stamp Album, U.S. Stamps, G&K Stamp Hinges and HE Harris Book "All About Stamp Collecting"
U.S. Stamp Collecting Kit with U.S. Stamp Album and U.S. Stamps. 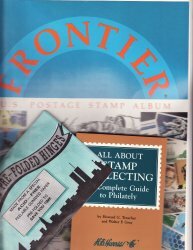 Kit contains Frontier U.S. Postage Stamp Album, 500 U.S. Stamps, 1000 G&K Stamp Hinges and HE Harris Book "All About Stamp Collecting"
Black & White images, 280 pages, four (4) of which are blank for extra stamps. Album pages are 9.5x12" All stamps are pictured with over 3,000 illustrations, printed on both sides of page. Spiral bound enabling all pages to lie flat, when album is opened. U.S. Stamps, Stamp Packet Collection, 500 different stamps. This is an excellent stamp packet mixture of 500 different stamps from the U.S. The stamps of the U.S.A. reflect this North American country's art, customs, history, and people. This mixture of canceled, mint and/or used all different stamps, may contain sets. These stamps are an excellent way to begin or enlarge a collection. Scan is an example of the contents of a collection. G&K Prefolded Stamp Hinges, package of 1,000 hinges. Hinges are made from a special acid free gummed paper. Prefolded to save you time. All About Stamp Collecting, 2nd Ed., published by HE Harris & Co. A complete guide to Philately. 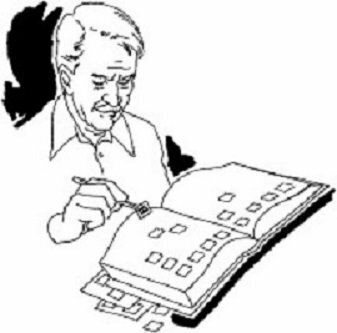 An easy to read, graphically illustrated guidebook, designed especially for the beginning stamp collector. Please note that this album weighs two and one half (2.5) pounds, is too heavy for USPS First Class Mail., and does not qualify for USPS Media Mail. Shipment with USPS Priority Mail.